Join Elaine Wilson, one of the District’s pioneer/certified monitors and her team for a spring monitoring at this beautiful site in Catharpin Creek in the Gainesville area. This site has some outstanding critters that are unique only to this site. STEM kids are welcome. Spots are limited. For more information and RSVP, contact Elaine Wilson. 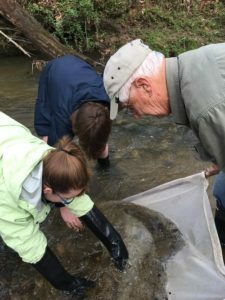 Join Friends of Accotink Creek volunteers as they assess ecological conditions in a stream, based on the presence and absence of bottom-dwelling invertebrates. Meet at the parking lot behind Lake Accotink Park Administrative Building. See Friends of Accotink Creek for additional stream monitoring information. Healthy streams and waterways support a wide range of native flora and fauna. The stream running through your neighborhood is vitally important to ensuring that our larger tributaries such as the Potomac River and Goose Creek remain healthy to sustain a diverse wildlife habitat. Local streams can, however, become impaired by urban runoff and development. Join us for a stream-side demonstration and discussion examining how citizen science surveys can be used to assess local stream quality. You will see how biomonitoring surveys are conducted. You will have a chance to look at the data and at aquatic macroinvertebrates. We will discuss how the data is analyzed and how it can be used to improve our streams. At the end, you will have the opportunity to sign up for a spring survey, led by one of Loudoun Wildlife’s citizen science stream monitoring teams. Registration is limited, RSVP to Loudoun Wildlife. Join Veronica Tangiri of Prince William SWCD for citizen science monitoring. Come and learn more about the health of this stream and how it interacts with agriculture as it joins the Occoquan River. Contact Veronica for more information or to register. Join Buck Arvin and the Merrimack Master Naturalist Team in monitoring Powells Creek in the Montclair area. Residents are welcome to come and support the data collection of this stream and learn more about water quality in their area. For directions and more information, please RSVP to Buck. Join Elaine Wilson, one of Prince William SWCD’s pioneers/certified monitors and her team for winter monitoring at this beautiful site in Catharpin Creek in the Gainesville area. This site has some outstanding critters that are unique only to this site. STEM kids are welcome. Spots are limited. For more information and RSVP, contact Elaine Wilson. Join NVSWCD as we discover aquatic life in Pohick Creek! This official NVSWCD stream monitoring workshop covers watershed health, what macroinvertebrates tell us about stream quality, and what you can do to prevent pollution in your local stream. Registration is limited. RSVP to Ashley Palmer. Assist in important winter stream monitoring by getting your feet wet in one of Reston’s streams? RA welcomes new volunteers to assist with stream monitoring at several locations. Get involved with a small team to collect data and identify insects with the goal of assessing the health of Reston’s stream. Not only do you get to learn about streams, it also provides an opportunity to make new friends. Learn more and register. Assist in important winter stream monitoring by getting your feet wet in one of Reston’s streams! RA welcomes new volunteers to assist with stream monitoring at several locations. Get involved with a small team to collect data and identify insects with the goal of assessing the health of Reston’s stream. Not only do you get to learn about streams, it also provides an opportunity to make new friends. Learn more and register. Join a stream monitor at this outdoor learning site along Bull Run Trail. Registration is limited. RSVP to Jess Cushman at cushman.jess@gmail.com. Join Northern Virginia Soil and Water Conservation District (NVSWCD) as we discover aquatic life in Pohick Creek! This official NVSWCD stream monitoring workshop covers watershed health, what macroinvertebrates tell us about stream quality, and what you can do to prevent pollution in your local stream. Registration is limited. RSVP to Ashley Palmer at Ashley.Palmer@fairfaxcounty.gov. What’s in these streams? Come find out! Ever wonder what’s living in our local streams? Join a stream monitoring team and help gauge local water quality by surveying aquatic organisms living on the stream bottom. Led by certified stream monitors, the teams welcome interested observers and offer an opportunity to explore Northern Virginia’s lovely creeks. Registration is required and limited. Register by email to Ashley Palmer at Ashley.Palmer@fairfaxcounty.gov, Northern Virginia Soil and Water Conservation District Conservation Education Specialist. Limit 7. Registration required. The exact location will be sent to registered participants closer to the date. The rain date for this event is October 14. Contact info@loudounwildlife.org for registration and questions. Limit 7. Registration required. The exact location will be sent to registered participants closer to the date. The rain date for this event is October 21. Contact info@loudounwildlife.org for registration and questions. Get involved with a small team to collect data and identify insects with the goal of assessing the health of Reston’s stream. Not only do you get to learn about streams, it also provides an opportunity to make new friends. Learn more and register. 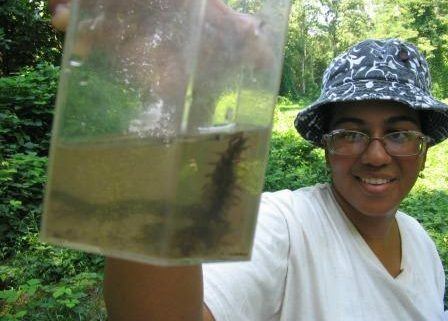 Join a volunteer certified stream monitor as she assesses ecological conditions in streams, based on the presence and abundance of bottom-dwelling invertebrates. Registration is required and limited. Register by email to Valerie Bertha. Join a volunteer certified stream monitor as she assesses ecological conditions in streams, based on the presence and abundance of bottom-dwelling invertebrates. Registration is required and limited to 5 registrants. Register by email to Susan Demsko. https://fairfaxmasternaturalists.org/wp-content/uploads/2018/10/IMG_6029.jpg 2448 3264 Janet Quinn https://fairfaxmasternaturalists.org/wp-content/uploads/2017/02/FMN-Logo-300x222-1-300x222.png Janet Quinn2018-10-03 17:44:482018-10-03 18:07:05What's in these streams? Come find out! The Fairfax chapter has approved a new citizen science service project (C257) to perform water chemistry testing in Chesapeake Bay watershed streams and rivers. The Alliance’s citizen water quality monitoring program is a regional network of trained volunteers who perform monthly water quality tests that help track the condition of waterways flowing toward the Chesapeake Bay. Each month, volunteers complete an observational survey at their stream site and conduct tests for dissolved oxygen, pH, water clarity, salinity (where appropriate), temperature, and bacteria. Data is reported to the Alliance, which partners with other water quality monitoring groups in the Chesapeake Monitoring Cooperative. Volunteers attend a training session where they learn about water quality and how to collect data following standardized protocols. Volunteers spend 1-2 hours monthly collecting data at their stream sites and completing the required tests within 8-48 hours, depending on the test. Volunteers complete a written report and submit data online or mail in the report. Volunteers may choose when they monitor, but they should try to monitor at the same time each month, although there is some flexibility for weather, etc. The Alliance would like each volunteer to monitor at least 10 times per year. Data is annually submitted the to Virginia DEQ for use in the Virginia’s 305(b)/303(d) Integrated Water Quality Assessment Report to EPA, which summarizes water quality conditions and identified waters that do not meet water quality standards. All volunteers are trained by Certified Watershed Coordinators under the Alliance’s Quality Assurance Program Plan (QAPP). Training includes an initial session where monitors learn about water quality and testing methods and an annual recertification session to check monitoring equipment, chemicals, and methods. To learn more about the program, contact the program coordinator Amy Hagerdon at ahagerdon@allianceforthebay.org. Join volunteers throughout Fairfax County who monitor water quality in local streams. The Northern Virginia Soil and Water Conservation District trains volunteers to assess ecological conditions in streams based on the presence and abundance of benthic macroinvertebrates (aquatic insects). Volunteers also learn how to take chemical measurements about nitrate/nitrite and turbidity. Training includes indoor and field workshops and mentoring by experienced monitors. Join Will Peterson of the Reston Association as he guides you through the monitoring protocol on one of the many beautiful streams that flows through Reston Association’s natural areas. For more information and to RSVP, please contact Will. Come out to Cub Run in Centerville, VA to learn more about benthic macroinvertebrates and how they can be used to determine the water quality of a stream. RSVP to Dan Schwartz or register through Fairfax County’s Volunteer Management System. Join Certified Volunteer Monitor Ho Yeon Jeong and the Conservation District at Ho Yeon’s adopted site along Wolftrap Creek in the Town of Vienna. Help monitor the health of this restored urban stream, a few miles upstream of its namesake performing arts center. Please RSVP to Dan Schwartz for directions and instructions.